Sarangani is a good flying site for paragliding said Armand Dard, a French national and a visiting paragliding professional instructor. "This is my second time in the Philippines and my first time in Sarangani. Last year I did some paragliding in Carmona, Cavite and also in Boracay but this place which I discovered one month ago is a better flight site,” Dard said. The flying site is located at SAFI Ranch 1 in barangay Seguil, less than a 30 minute drive from General Santos City. 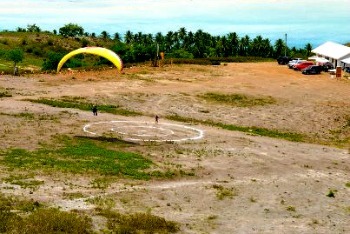 The flight site is overlooking Sarangani Bay. “It has comfortable take off and landing sites,” Dard noted. “It also has a big landing site comfortable for beginners and you can fly almost everyday." Dard is conducting paragliding international standard trainings to members of the newly-formed Sarangani Paragliding Club. “You ask what is the next big thing in Region 12, we are crossing our fingers -- but I believe in a heartbeat, it’s going to be Paragliding in Sarangani. It is definitely a number one for fun!” said an exuberant Michelle Solon, chair of the Regional Tourism Council. “Who said there is no wind around Sarangani Bay? On the contrary there is enough wind!” added Solon who has tried the sky sport of paragliding. Joseph Oncada, vice president of Sarangani Paragliding Club said they started paragliding in September last year, “and this is the newest sport in the country." "To those who want to become pilots, or just want to experience flying in tandem, we offer training and tandem flights," Oncada said. A short flight or a maximum of 10-minute flight would cost P2,300. “For a long flight or 15 to 20-minute flight, we charge P3,000," Oncada added.